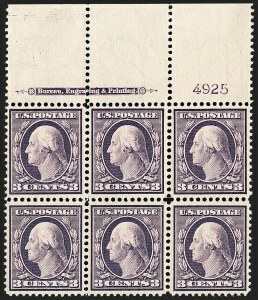 Scott 341 was produced from only one plate, number 4956, which had plate number blocks at top and bottom. 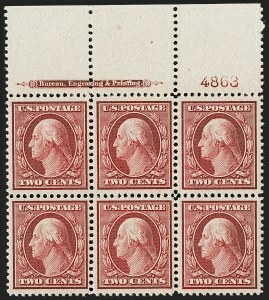 Lewis Kaufman records only six full top and four bottom plate blocks available to collectors. There is another top position in the Miller collection owned by The New York Public Library. 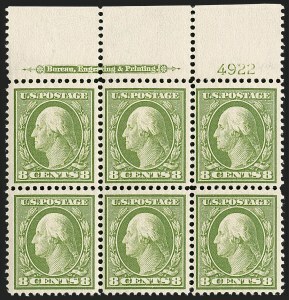 Excluding the Bluish Paper Issue, this is one of the rarest of the Washington-Franklin plate blocks. Lewis Kaufman records only seven top and five bottom plate blocks. The Bureau of Engraving and Printing experienced difficulty with paper shrinkage while printing the 1908 Issue--the Bluish Paper experiment of 1909 was intended to correct the problem--so this plate block's centering is exceptionally choice. 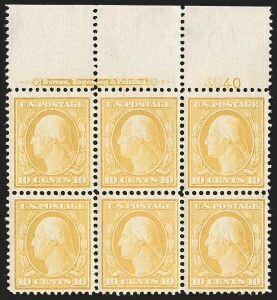 This is one of the two finest top plate blocks among the small population available to collectors (one top position is in the Miller collection owned by The New York Public Library). Other top plate blocks either have slightly reduced selvage, a fault or only Fine centering. The only example that matches the quality of this block was in the Dr. Frederick Fogelson collection. 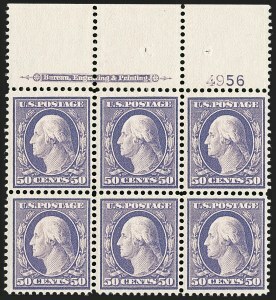 The Bluish Paper stamps were first produced in early 1909 to remedy problems in manufacturing and handling. The first problem was the effect of paper shrinkage on the perforation process, which the Third Assistant Postmaster General's report specifically noted as the reason for the experimental paper. The second reason is found in a letter dated February 16, 1909, from the Third Assistant Postmaster General, A. L. Lawshe, to the BEP director, Joseph E. Ralph, which states that the 1¢ and 2¢ stamps would be placed on sale at the Washington, D.C., post office, to determine if "they display less tendency to curl than the stamps made of the regular wood pulp paper." Paper shrinkage was the result of a necessary step in the printing process. In intaglio printing the sheet of paper was moistened before the impression was made, because the dampened paper picked up more of the ink in the recessed lines of the metal plate. 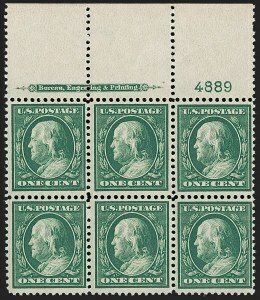 After the sheet dried, the paper would shrink slightly, causing the rows of individual stamp subjects to fall out of alignment with the fixed rows of perforation pins. Postal officials reported that 9% of stamps were unsatisfactory due to paper shrinkage. The curling and splitting problem occured after the sheets were perforated and divided into panes. As the gum dried, it pulled along the grain of the paper, causing each row of stamps to curl. Down the line, panes had a tendency to split apart along the perforations, making it difficult to package them for distribution or handle them at post offices. On February 1, 1909, the BEP director notified the Third Assistant Postmaster General that a supply of 1¢ and 2¢ stamps had been printed on an experimental rag paper stock, which the BEP developed to resolve the production and handling problems. The experimental paper--10,000 sheets in total--had 30% to 35% rag cloth added to the wood-pulp mixture. Ultimately, the rag stock did not prove to be an effective remedy and was discontinued. Better results were subsequently obtained by modifying the spacing of the six outside vertical rows on the plates (known as "Star" plates). 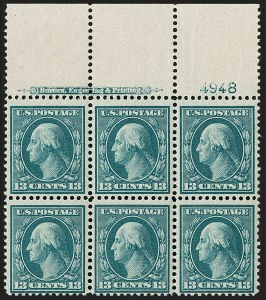 The stamps' distinctive grayish paper was first described as having "a bluish cast." The report of the Third Assistant Postmaster General (for the fiscal year ending June 30, 1909) described the experimental stamps as having a "slightly bluish tinge," and the moniker Bluish Paper entered philatelic lexicon permanently. 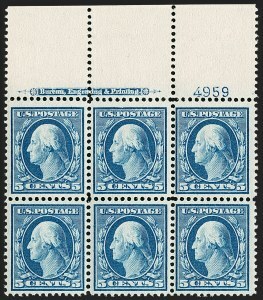 All Bluish Paper stamps were printed from plates of 400 subjects on the Hoe & Company four-plate intaglio press, which increased the speed of production through simultaneous tasking. The Hoe press had four positions and rotated. 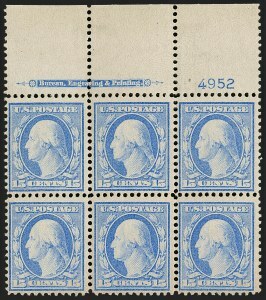 For this reason there are at least four plate numbers for each Bluish Paper stamp. Each sheet of 400 was divided into four panes. Lewis Kaufman records seven plate blocks of the 13¢ Bluish Paper--three from the top, three from the left and one from the bottom. 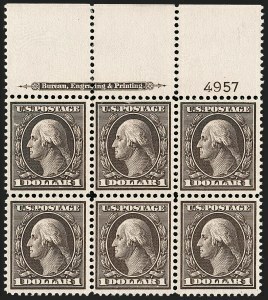 In addition to these plate blocks, there is one complete pane of 100 in private hands (plate number 4942 upper left, ex Weill Brothers' Stock) and another complete pane (plate number 4945 upper right) is in the "Postmaster General's Collection" at the Smithsonian National Postal Museum, which is the pane reported by Boggs from the Post Office Department files. 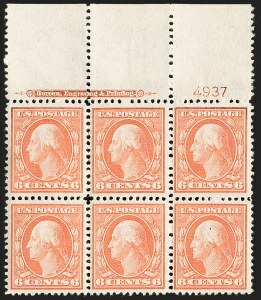 Although Lewis Kaufman records 24 plate blocks of the 15¢ Bluish Paper, top positions are rare and very desirable, particularly with Mint N.H. gum. We doubt there are more than a half-dozen Mint N.H. plate blocks extant in total, from all positions on the plate.